I am one of those people who goes from having a sore throat today to having bronchitis tomorrow. I don’t know why that is. Every year over the 16th of June long weekend we would go away to Sedgefield and we would leave home and I would feel fine and by the time we got halfway there I would have a runny nose and an itchy throat. We would stop in George and get over the counter medication, and hope it worked its magic to sway off the infection. Eventually my house Doctor realized that a single dose of celestamine would do the trick, and so he prescribed them to me. This is a tiny pill, taken just before I go to sleep, which contains cortisone and an antihistamine. Usually this works, and by the next morning all is well. Last year I ended up with a sore throat and only realized I had run out of my pink tablets when we got home from being with friends for dinner. By Sunday I was feeling dreadful and by Monday I was feeling brittle. I eventually got to see my Doctor on the Tuesday and it was a full blown course of antibiotics for me. Now I make sure I always have the celestamines next to my bed. But, they have to be taken at night and a sore throat can start any time. I have had one for 3 days now, and I am doing my best to make sure that it does not become serious. I am taking all sorts of home remedies and tissue salts and over the counter medications, all in the hope that at least one of them will keep me germ free. To console myself, I am snacking away on some pistachio brittle. What do you eat to comfort yourself when you are not feeling well? Because we all deserve something sweet! It’s not just pistachio brittle though, is it? I can see some ice cream in there too… I love any type of toffee or brittle and can sonsume large quantities without even thinking. Just for medicinal purposes you understand. 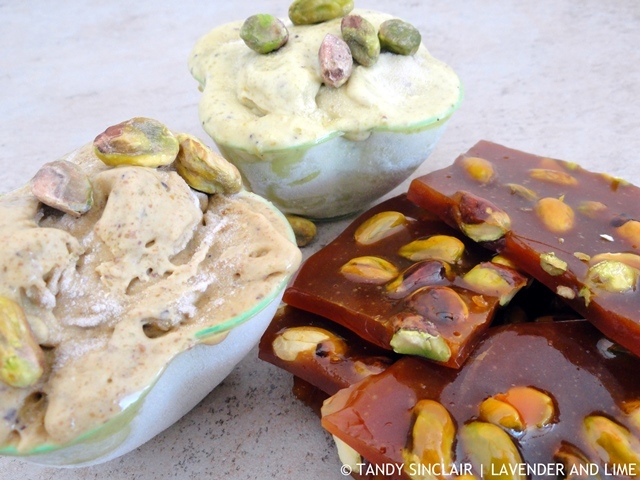 I love peanut brittle and pistachios so I know I would absolutely LOVE this! JR would love this – he loves brittle. Whoa.. what??? This sounds amazing!! I remember at my home, my mom used to buy peanut brittle on special occasions, and I couldn’t get enough of the stuff, even though I didn’t really like peanuts! This is taking it to the next level. Love this!! I love brittle, as a child my grandma always used to make me walnut brittle, so delicious and addicting. Will have to make this for Pete when he is next home. Pistachios are his favourite. Have a beautiful evening Tandy. Oh bless, Hope you’ll feel much better soon!! I am impressed by your energy to actually make something. I am rarely ill, but when I am you’d know. I am usually in a state that someone may thing I am just about to die. I am a true man on this. Looks gorgeous, Tandy! I love pistachios! Never had brittle before, but I’m willing to try!